When Frank Lloyd Wright met Marcel Duchamp! They, and others talked for nine hours. That’s Duchamp on the left and Frank Lloyd Wright in the center. You can download and listen to 7.5 hours of it. 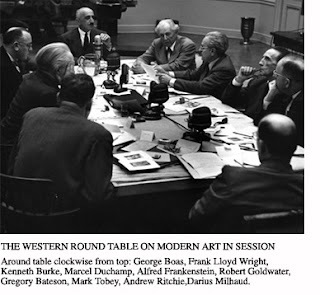 The Western Round Table on Modern Art met in San Francisco on April 8, 9 and 10, 1949. The artists and critics opine on art in a changing culture, degeneracy, science, communication, the public, the critic, and other topics, including my favorite – the beautiful. You are currently browsing the archives for the Milhaud category.